I finished another bear today. 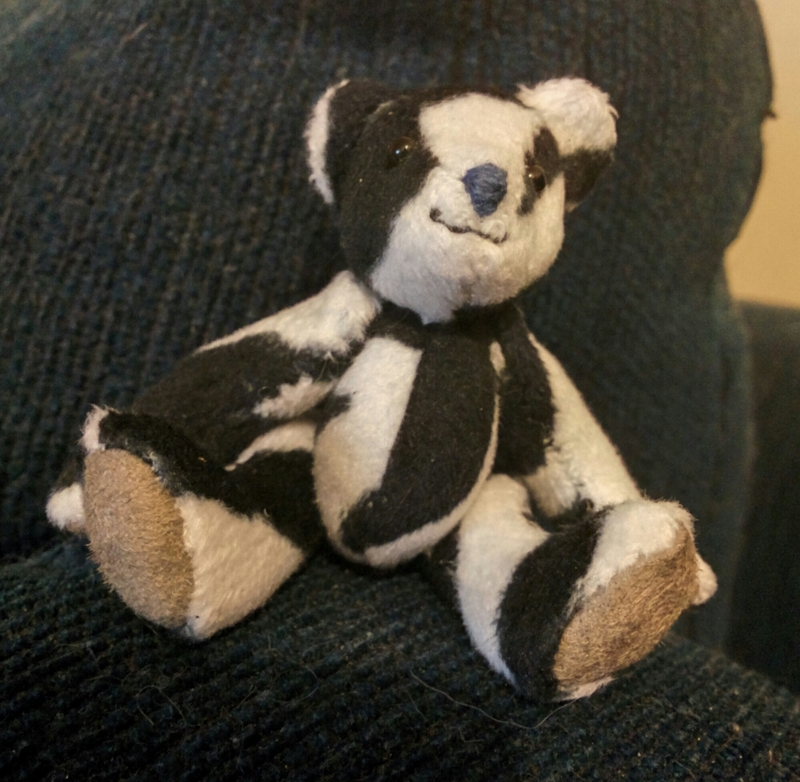 He looks a lot like a badger, though, as I used a zebra print minky fabric that was too large for the little bear. But you don’t know if some things will work until you try. His ears are also a little wonky, but you didn’t know that until I told you and now you can’t unsee it. I’d like to find a nice upholstery velvet, as that gives the same effect as fur fabric on a large bear, and looks more professional. It’s also hard to buy it online, as you can’t feel and see the fabric and know how it will act until it’s in your hands, and that could waste some money. Especially since all the different sellers have different opinions on what short pile fabric is. Guess I’ll have to go actual shopping. Today, I finished this little guy. I started him yesterday, and watched YouTube as I sewed. 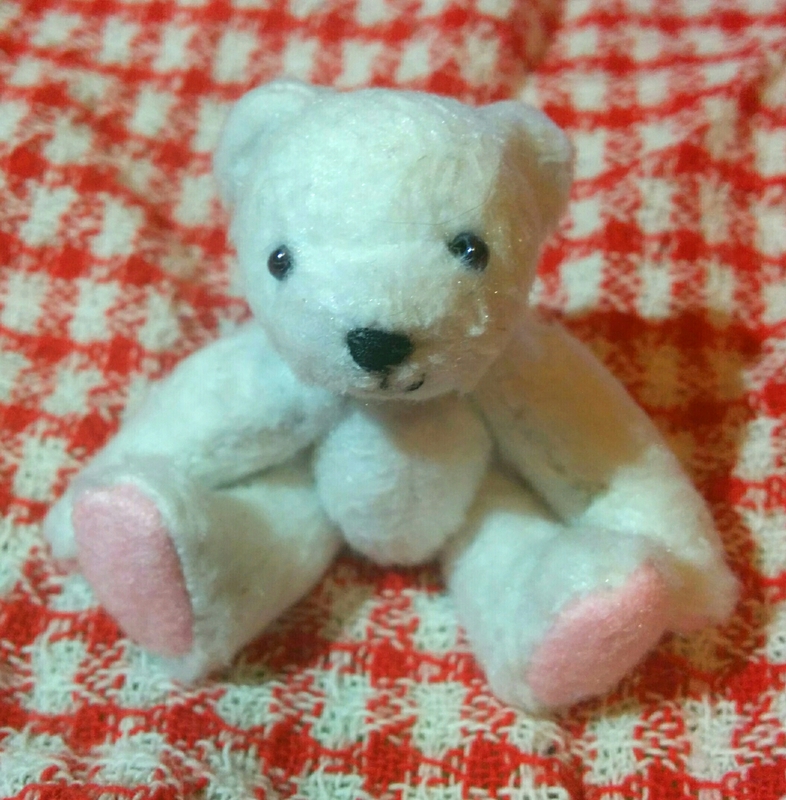 I occasionally randomly make a bear like this, as you’d know if you’ve followed me for a while. He’s completely hand sewn and is 2.5 inches high (6.5cm.) I’ve also pulled out a bunch of other bear making fabric to make some more, and have cut one out of a second hand suede skirt that I bought ages ago for this purpose. While working fiddly projects, I often have to switch between that and a larger project to give my hands a break so they don’t cramp up too much. 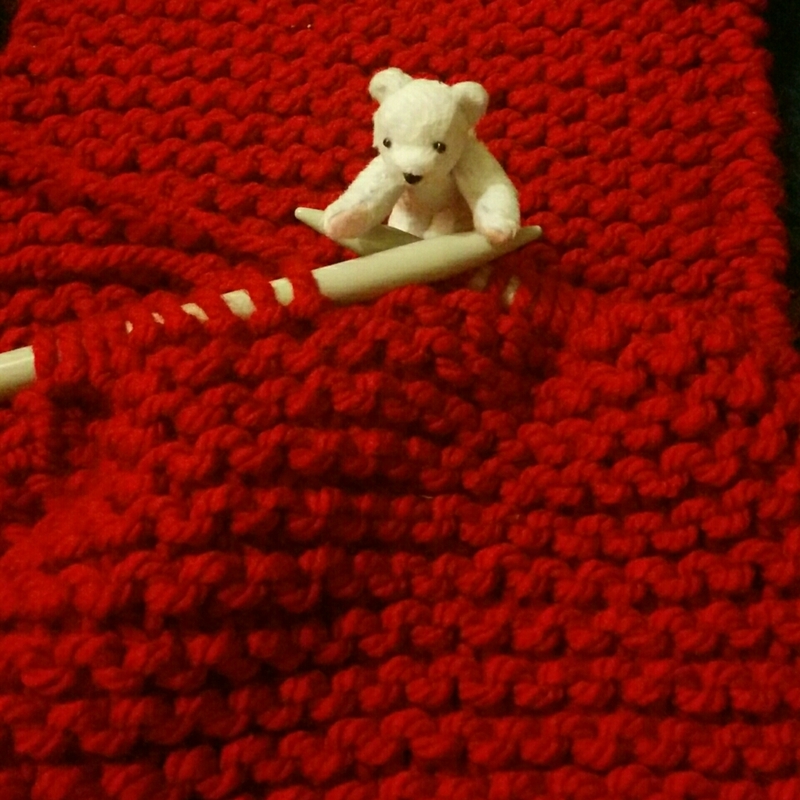 Here is a half finished scarf that I found when I was looking for large needles to start a red scarf… I also found a barely started green one, too. But now, I need your help. My little bear needs a name and an outfit! Please help me, and my little fellow, out. Leave your suggestions in the comments! 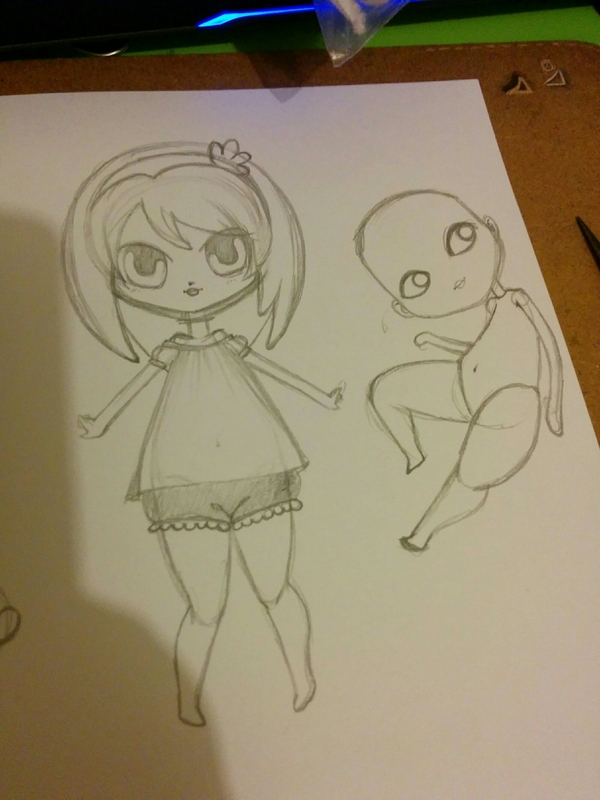 Today, I watched a chibi drawing tutorial by Yamio. She has the cutest voice, and adorable drawings, so I really like her YouTube channel. This tutorial is really good, especially as it teaches you to create chibi characters, but not as a step by step, but shows way that you can choose what you like and pick and mix to create your own style. I attempted one, thinking about shapes and ‘beans’, but it seemed a little static, causing the second one to be super dynamic, which produced a nice doll-like figure. I’m trying to come up with little pictures, so that I can practice inking with a dip pen, as an exercise. I’m drawing them on printer paper, so that I can put it on my diy light table (glass table with a lamp under it,) and easily see through the thin paper. I’d like to create some colouring pages in this way. I can draw a bunch of separate doodles, and draw them into one piece on the light box. This also means I don’t have to worry about erasing pencil beneath the ink, which is always a gamble. If you don’t have a light box or glass table, you can use a window, or stuck a battery torch into an upside down plastic box with a smooth base. Just keep an eye on the heat that might build. Previously, I have used a piece of glass between two chairs with a bedside lamp under it. Arting is often 90% improvising. Very quick update, as it’s quite late. Passed our inspection, so I’m very exhausted and found some new muscles in my legs while I was cleaning. 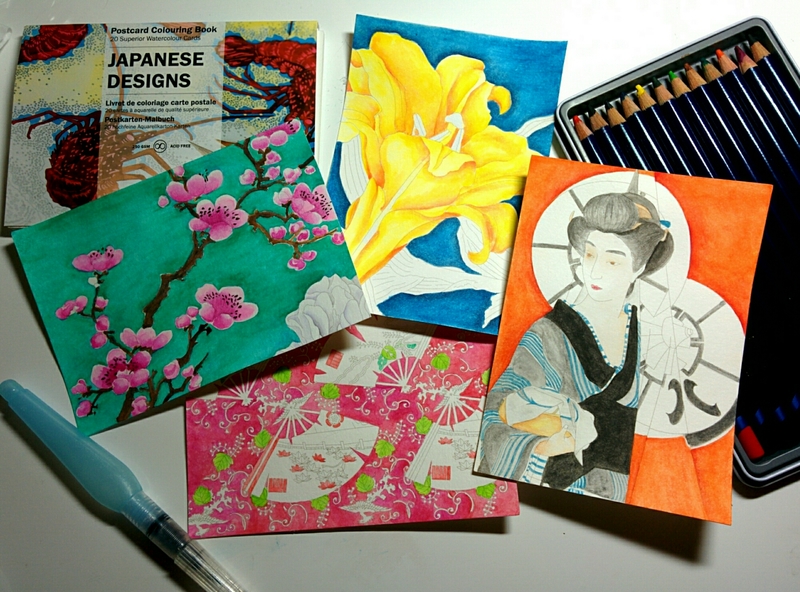 I used my inktense pencils and a water brush to colour in some Japanese themed postcards. I would never trust these in the mil, and that would mean I’d have to go somewhere or write to someone. So I think these would look nice in some frames. They’re the same size as standard photos, so the frames will be cheap and easy to find. Just need to find a place to put them. I went to a craft shop for the first time in a long time. I didn’t feel like buying anything after I had to clean up my craft room. There is so much stuff! I did end up buying a big ball of red T-shirt yarn, so I can make myself a non itchy scarf. I used a coupon, so it didn’t cost me anything, so I don’t feel too bad about it, hehe.